As a leading global finance firm focused on law and the world’s largest publicly traded provider of litigation finance, it will come as no surprise that Burford Capital welcomes the Law Reform Commission’s 12 October 2016 Final Report on Third Party Funding for Arbitration, recommending a new openness to “third party funding” (also known as litigation finance or litigation funding) in Hong Kong. Burford’s own experience proves that there is significant client demand in Hong Kong for outside capital to cover the extraordinary cost of commercial litigation and arbitration. A meaningful number of commercial users of dispute resolution want or need to access external capital. This trend is driven by the unceasing rise in litigation cost, ever-growing litigation volumes and enhanced corporate sensitivity to incurring legal expense. Moreover, corporations around the world are increasingly recognising that litigation and arbitration claims are valuable corporate assets, just like any other contingent receivable, and are capable of underpinning corporate financing activity. A move toward third-party funding in Hong Kong enables this clear business need to be met. Hong Kong’s move toward openness to third party funding will also help to ensure that it keeps pace with competing arbitration centres around the world, among them Singapore, which has very recently introduced legislation to open the door to litigation finance. Indeed, as the Final Report asserts, “proposed reforms are necessary to enhance Hong Kong’s competitive position as an international arbitration centre”. Billions of dollars of external capital have already flowed to arbitration centres like London and New York. Hong Kong has heretofore persisted as a noticeable outlier among sophisticated legal and capital markets centres in maintaining significant restrictions on commercial litigation and arbitration finance. By failing to remove barriers to its use, Hong Kong has already fallen behind other such centres and is continuing to see its position erode. The recommendations of the Final Report will help address Hong Kong’s competitive gap with other arbitration centres – but we would go further. Hong Kong should not only follow the Final Report’s recommendation to remove any ambiguity and explicitly allow the use of litigation finance in arbitration, but it should also expand the sanctioned use of litigation finance generally, including in commercial litigation. As Hong Kong opens to third party funding of arbitration, we would also caution against the adoption of an unduly regulatory environment, which would discourage capital flows and disadvantage Hong Kong relative to other centres. Burford already faces far more demand for its capital than it has capital available. Adopting an unduly regulatory or interventionist approach to third party funding will not solve the current disinclination to do business in Hong Kong and will simply leave the status quo in place. Third party funding has enjoyed widespread adoption in the major English-language common law jurisdictions such as the United States and the United Kingdom, as well as in international arbitrations conducted by institutions such as the ICC, LCIA, ICSID, PCA, AAA and others. Thus, if Hong Kong merely opens the door a crack to litigation finance but seeks an onerous and intrusive regulatory regime, it will achieve much the same result as if it had not engaged in any reform at all. Moreover, if any regulation is to occur, Burford strongly objects to the concept that regulation is appropriate based on the identity or line of business of the capital provider as opposed to the activity or function being carried out. A company that calls itself a “third party funder” should not be regulated differently than an insurance company or hedge fund that does essentially the same thing in providing external capital to arbitration. A hedge or private equity fund or an insurer providing capital in support of a litigation matter – in whatever form of transaction – must be subject to the same regulation as a “funder”. To proceed otherwise would be unfair and discriminatory. The other issue Hong Kong needs to approach cautiously relates to adverse costs. Litigation funders are capital providers; they focus on annualised returns. Taking on others’ risk isn’t free. If litigation funders become liable for adverse costs, their prices will increase, reversing some of the access to justice gains sought by having them in existence in the first place. The way that position is managed in the UK is through the availability of litigation cost insurance; litigation funders insist that their clients purchase such insurance to protect both the client and the funder from a potential award of adverse costs, and the price of the insurance, while expensive, is considerably lower than funders would charge for assuming the same level of risk (as insurers have a lower cost of capital than funders). 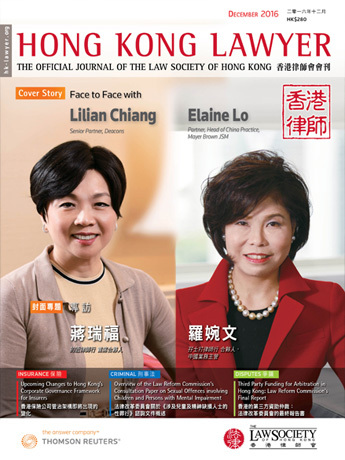 However, there is not a comparable robust litigation insurance market in Hong Kong, which means that pushing the risk of adverse costs onto funders will ultimately come at a very high price to claimants. Defendants may like that result, and it is not surprising that defence counsel lobby for it, but it is bad policy. All of that said, we are heartened by the Final Report’s recommendation of a “light touch” approach to the regulation of third party funding of arbitration in Hong Kong for an initial period of three years, and we urge that this approach become a more permanent stance thereafter. But the implementation will be important, and needs to happen in the context of a global capital market, not a parochial legal system.